I think it's stunning Sylvie! Simply wonderful! I honestly don't think that you can possibly say that you'll 'get there' with CAS cards, you've decidedly arrived! Your card really stood out in the pictures of those who've played so far this week. I love that you've cut the image into three and it really does look like a film strip. Love it! Great card! Looks like you've nailed the CAS style - I agree it can be really challenging, though but this challenge is great for inspiration. Gorgeous card Sylvie. Love the image and glad to see that you are still making me jealous with the sea in the background!! Hope you enjoy the film and the rest of your day. I love this card, a really good idea!!! Sylvie this is just WONDERFUL! Terrific card Sylvie.. love the film strip border - and you don't seem to be having any problem getting the CAS theme just right! Wow that's gorgeous. You could just walk in and sit on the porch! Love it! Sylvia this is stunning! love it! Love this - so stunning. Fabulous sunshine too!!! Its a stunning card, I love your scene. Love the use of the punched border and the Stampscape looks fantastic with that treatment! Wow! Sylvie this is a wonderful creation. Love the image you've used and the fab background. This is stunning, I love the way you have cut them into 3 squares and mounted them in a strip. Haven't done mine yet finding inspiration difficult. Sylvie, I LOVE this!!! I have this stamp and never thought to use it that way!!! Thanks so much for the inspiration! Stunnig card! The filmstrip effect is very effective and a great interpretation of the theme. Stunning card, what a brilliant idea. WOW! This is so beautiful, and I love the design to look like a photo strip. This is fabulous ! love how you have cut the scene into three and used the film strip to tie it all together. I really like the triptych effect you've achieved on this card. The colouring is fabulous, and the backing mount brilliant. I think you've nailed CAS!! Absolutely fabulous. So different and so cleverly done. Hi Sylvie, thought I would pop by and introduce myself too. I am also part of the Christmas Gang and am so glad you have joined us:). I have to add that this card is absolutely stunning, you have this less is more sussed!! Im another one of the Christmas Club so couldnt wait to come over and meet you properly! What a beautiful jaunt Ive had browsing your stunning cards oh and to hear about all of the beautiful weather that you get is just lovely also! 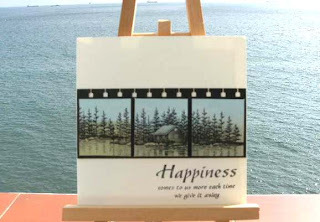 Seeing your cards framed by the sea is just amazing and did smile at your fear that one recently blew off the wall!! What a way to go though eh?! Ooh, What a pretty scene! A pretty scene behind the card too! What a wonderful card!! I love how you have made it like a landscape picture using the squares. Brilliant!! Wow this is beautiful and very stylish! I really like the filmstrip effect that you have achieved. I would have never thought to stamp a scene and cut it up - thank you for the idea - it looks really good. Wowzers, stunning Sylvie!! Very different style for you, I like it......multi - talented me thinks!! WOW Sylvie, this is stunning. Grt where? Whereeve it is you've got there I think!! Love this scene, works beautifully cut in to three like this, absolutely perfect. Great card - wonderful take on the theme and creative use of your supplies to achieve the filmstrip look. Plus, you get the top award for most scenic photography of your cards. Love the water in the background! Lucky you to have the light reflecting off water to aid your photography! I love how you have carried the picture through the three squares and given the effect of a film slide. Great idea with the fake photo strip - looks gorgeous! This card is beautiful and so peaceful. wow sylvie this is an absolute stunner, love it. Breath-takingly beautiful Sylvie! Hope you enjoyed the films! awesome card,great way to do "3 Squares"
This is really beautiful. I love how you have made the woodland scene into a film strip. I want to stay in that little cabin! !